I love my Galaxy Tab, but I am also eagerly awaiting some of the other new tablets. This is going to be a slugfest for sure. 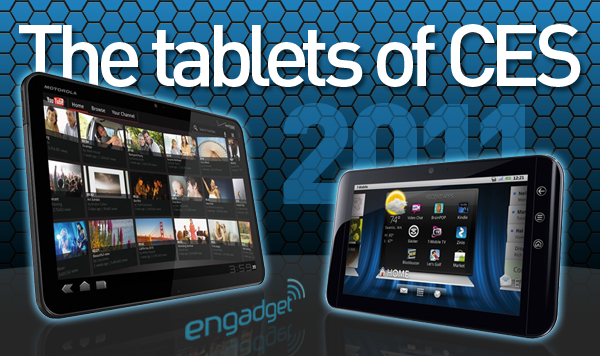 Thanks to Endgadget, here is a complete list of all of the tablets that were announced at CES. The best announcement for me personally though, was the prospect of moving on from my Nexus One phone. While I’ve definitely loved the phone, it’s now 1 year old — and no self respecting geek could carry such a “brick”. The phone that sparked my imagination the most? The Motorola Atrix 4G. Shortly before the Motorola announcement, I was sure that I would be snapping up the HTC Inspire 4G, which is the North American version of the HTC Desire HD. I (sadly) purchased the amazing Desire HD last fall during a business trip to Europe — only to land back in the US to discover that it doesn’t support the US 3G bands. Doh! The HTC phone is absolutely incredible, and if it worked in the US, it would be my favorite all time phone – so I’m sure that the HTC Inspire will be a huge hit. 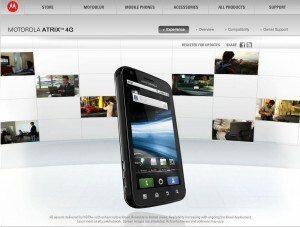 But, Motorola has lapped the competition with the Atrix. The phone itself is nothing spectacular to look at in terms of design, and were it simply a matter of choosing between it and the Inspire, I would probably choose the Inspire. But with the Atrix, there are two things that completely set it apart and on top of my list. The first is the NVidia Tegra dual core processor. This looks like it will be a game changer in terms of performance. But the second thing is the one that continues to have me daydreaming – a laptop dock. Yes, you read that right, but no, we’re not talking about putting your phone in a dock attached to a laptop. Instead the “laptop” is simply a shell. The phone is what powers it! For me, this is mind blowing. Imagine managing your email, social updates and casual surfing all on your phone, er…, laptop. When you plug the phone into the shell, it spawns a program called WebTop, which is an “operating system” overlay that gives you the feel of an actual computer – even though it’s your phone. Hard to imagine, I know, and even harder to describe. So, maybe you should just have a look at Motorola’s promotional site. Don’t worry, I’ve signed up to be notified the moment this bad boy is available for sale, and I will definitely be first in line at my local AT&T store.